Being the son of a giant of 20th-century cinema might leave a modern filmmaker with the occasional crisis of confidence. If Fyodor Bondarchuk has this problem, he hides it well. “Fools — fools or haters,” the Russian director said of his critics during an interview on the Russian talk show “Temporarily Available” late last year. Impeccable in a three-piece suit, Bondarchuk interrupted the interview multiple times to field personal cell phone calls while the show’s hosts looked on in amazement. Bondarchuk, 47, may be all but unknown in the United States, but he’s one of the most dominant — and self-assured — figures in post-Soviet film. 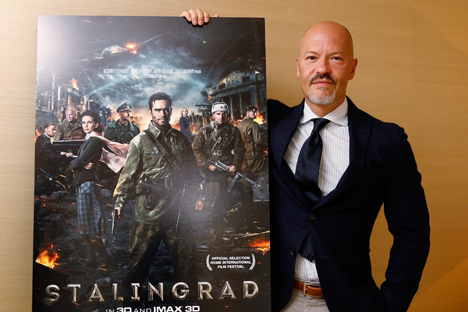 starring roles as an actor, Bondarchuk has directed two of the highest-grossing Russian films of all time: the Afghan war drama “Ninth Company” (2005) and the World War II spectacle “Stalingrad” (2013), Russia’s first film shot in Imax 3D. Bondarchuk was born in Moscow to actress Irina Skobtseva and Academy Award–winning director Sergei Bondarchuk. He graduated from the Russian State Institute of Cinematography (VGIK) in 1991. He made his debut as an actor in 1986 and began working as an assistant director in 1987 while still a student. In 1990, he became one of the first Russian producers of music videos and in the 2000s, he also made a name for himself as a popular TV-host. He has directed eight films and played more then 50 roles. A taste for epics seems to run in the family. Bondarchuk is the son of the legendary Soviet filmmaker Sergei Bondarchuk, who wrote, directed and starred in the 1967 film adaptation of Tolstoy’s “War and Peace,” which won an Oscar for Best Foreign Film. Both directed his first film at the age of 38. Both raised eyebrows with production budgets that shattered Russian records — Sergei with his “War and Peace,” Fyodor with both his sci-fi epic “The Inhabited Island” (2008) and “Stalingrad.” And both men have been among the few Russian directors to break into Hollywood. The younger Bondarchuk hasn’t matched his father’s Oscar yet, but he had his first shot with “Stalingrad,” which Russia chose as its submission to the 2014 Academy Awards. The film failed to make the Academy’s short list of nominees for Best Foreign Picture — perhaps in part because of the shock of just how “Hollywood” it was. “Stalingrad” is a world away from the art-house fare of Russian directors better known on the festival circuit, such as Andrei Zvyagintsev (“The Return,” “Elena,” “Leviathan”) and Aleksandr Sokurov (“Russian Ark,” “Faust”). Instead, Bondarchuk takes cues from his early years as a music video director. “Every time, I am trying to break the rules, at least as the conservative people see them,” Bondarchuk told Salon.com. His brand of iconoclasm has paid off big. “Stalingrad” garnered $55 million domestically and another $11 million in China. Still, it divided Russian critics with its hyper-saturated, digitally enhanced visual style and what some called shallow storytelling. Comic book heroics have dominated U.S. cinema for years, so Bondarchuk’s style would seem to makes him a natural fit. “We’re in talks to have the same camera crew and visual effects studio from ‘Stalingrad’ … on ‘The Odyssey,’” Bondarchuk told Russian daily Izvestiya. The filmmaker will be looking to repeat the success of the last Russian director to make it big in Hollywood, Timur Bekmambetov—while avoiding his failure. In 2008, Bekmambetov was tapped to direct the Angelina Jolie action film “Wanted.” It was a box office smash, grossing more than $340 million worldwide. But Bekmambetov followed it with a bomb, “Abraham Lincoln: Vampire Hunter,” which grossed only $37 million in the U.S. on a budget of $69 million.